After reading the excellent Naples ’44, I was eager to read more by Norman Lewis. So when I was exploring my mum’s bookshelves the other day, I was pleased to find a dusty copy of I Came, I Saw, which I quickly saved from a life of being hidden behind many other dusty books. Naples ’44 means a lot to me because it was written about a time and place that was significant for my family. It is well written and honest. I’m glad to say that Lewis hadn’t lost his writing skills when he sat down to create this autobiography. 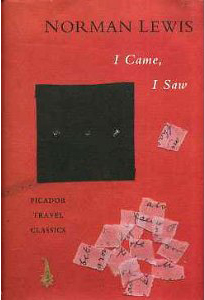 (NOTE: I Came, I Saw is a republication of Jackdaw Cake, published in 1985 – I Came, I Saw has an extra fifty pages about Lewis’ time in South Italy in the 1960s and 1970s). Lewis’ life may have been jam packed with incredible experiences and he may have been very well travelled by the time he died, but this wasn’t always the case. He started off as an awkward little boy with odd parents and even odder relatives. When he was young, he was packed off to live for a while with his father’s family in Wales to become a ‘Welshman’. There, he only had three strange aunties and his grandfather, who did not even speak to him, as company. I’ve been told that everybody has a mad aunt, but Norman Lewis had three; Aunt Polly, Aunt Annie and Aunt Lil. There are many humorous anecdotes about Lewis’ time living with his peculiar aunts, but it does not sound like a happy childhood, and it did not help him to become more confident or outgoing, and it certainly didn’t make him a proper ‘Welshman’. He arrived home to find both his parents had become Spiritualists. Obviously this makes for more anecdotes and funny stories, but Norman Lewis was simply not interested in that sort of life, and quickly moved on to try his hand at anything and everything. This is when his life finally started to get more interesting. After marrying Ernestina and meeting her eccentric family, doors finally opened up for the young Norman Lewis. From that point on he spent most of his years travelling, learning new languages and writing about all his experiences. In the Second World War, Lewis was posted as an intelligence officer in North Africa, where Arabic speakers were supposedly needed. Here, he and his comrades spent a lot of time waiting around, with very little to do. What I found most interesting is the attitudes that the British had towards the French and the Arabs. Many of the offices seemed to turn a blind eye to crimes committed by rich and generous French men and there was little effort given to try and keep the peace between the two races. As in Naples ’44, Lewis shows himself as a fair and unbiased person. He made some good friends within the Arab community and was careful not to accept bribes from certain French criminals. There are so many experiences of World War Two that are not as widely known as Nazi Germany or the French Resistance. Lewis describes his part in it brilliantly, with straightforward honesty and I imagine very little embellishment. The more I read by Norman Lewis, the more I want to read. He immersed himself in the culture of every place he visited by getting to know the locals and learning the language, making his books both detailed and informative. His writing is unbiased, unpretentious and very readable which is rare in autobiographical works. Lewis’ autobiography isn’t overpowered by his opinions and emotions, but still displays enough of his personality and passion for travel. The only thing I would have preferred, is a more personal account of his family when he lived with them in Italy towards the end of the book. A loving portrayal of his children and wife, rather than a factual unravelling of events and descriptions of locations, would have been the icing on the cake! Considering that I love to travel, this may be a good work for me. It’s a really good travel book. I’ve never really read an autobiographical travel book like it!